Thinking about going a family hike, but worried about potential illnesses from bug bites? Despite widespread media coverage of Lyme disease, the Zika virus and other insect-induced illnesses, the vast majority of bugs in Tennessee are just pests and not harmful to your health. Here’s what Tennesseans need to know about bugs and bites. Many species of spiders call Tennessee home, but according to the Centers for Disease Control and Prevention (CDC), only two are poisonous to humans: the brown recluse and the black widow. The brown recluse — known for the dark violin-shaped (or fiddle-shaped) marking on its head — can only bite humans if there is some form of counter pressure trapping it against the skin. A small white blister usually forms at the bite site, followed by a lesion under the skin. The black widow — known for the bright red markings underneath its abdomen — is usually found outdoors and only bites humans who come into direct contact with its web. Black widow bites are easily identifiable by two puncture marks in the skin, followed by pain that spreads throughout the body. Unless you’re experiencing these or other severe symptoms, a spider bite will usually heal without medical attention. Tick bites are common in Tennessee, but unless you’re experiencing a fever, chills, aches and pains, vomiting or a rash, you’re probably in the clear. Only blacklegged ticks can cause Lyme disease, but they’re most common in the northeastern U.S. In 2014, 96% of confirmed Lyme disease cases occurred in 14 states across those regions, including New York, Connecticut and Vermont. Tick-induced Rocky Mountain spotted fever is more common in the southern United States, but causes noticeable and immediate symptoms (such as fever, headache, abdominal pain, vomiting and muscle pain) and can be treated with antibiotics when caught early. Prevalent in Tennessee and other southern states, bites from these pesky insects can certainly make you itch, but will very rarely make you sick. The Zika virus has been a hot topic in the news lately, but while the CDC reports 1,404 cases in the U.S., most of those infected had traveled abroad and did not contract the disease locally. To learn more about Zika, click here. Other mosquito-related illnesses, including West Nile, have been reported in small numbers in Tennessee, but none of these cases has been fatal. Less than 1% of people affected with the disease experience any serious symptoms or complications. While you’re highly unlikely to contract a disease from mosquitoes in this part of the country, it’s nevertheless a good idea to wear repellents containing DEET, picaridin, IR3535, and oil of lemon eucalyptus or para-menthane-diol when going outside. Last year, the CDC reported that the triatomine bug (or “kissing bug”) had made its way to Tennessee and Georgia. This insect is known for carrying the parasite Trypanosoma cruzi that spreads Chagas, an inflammatory infection that causes heart and digestive problems. 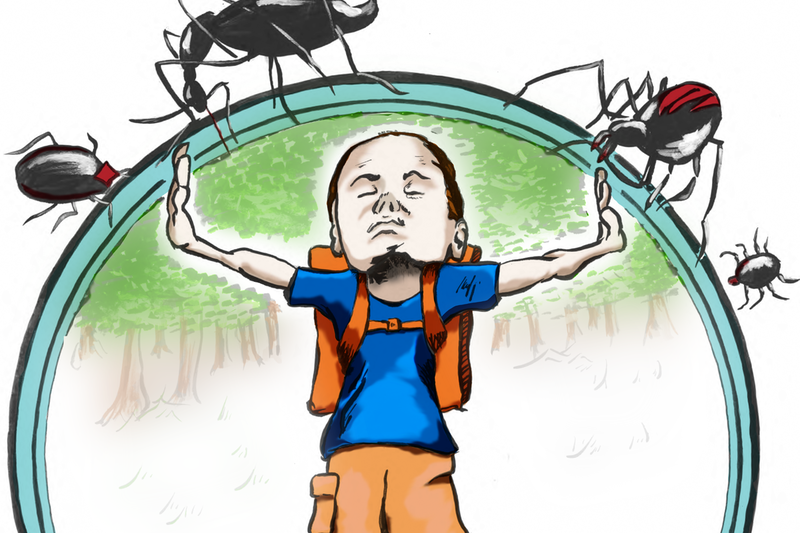 Don’t let fear of creepy crawlies interfere with your love of the great outdoors. Just take the proper precautions and know that your chances of encountering dangerous spiders and bugs in Tennessee are in fact very low.